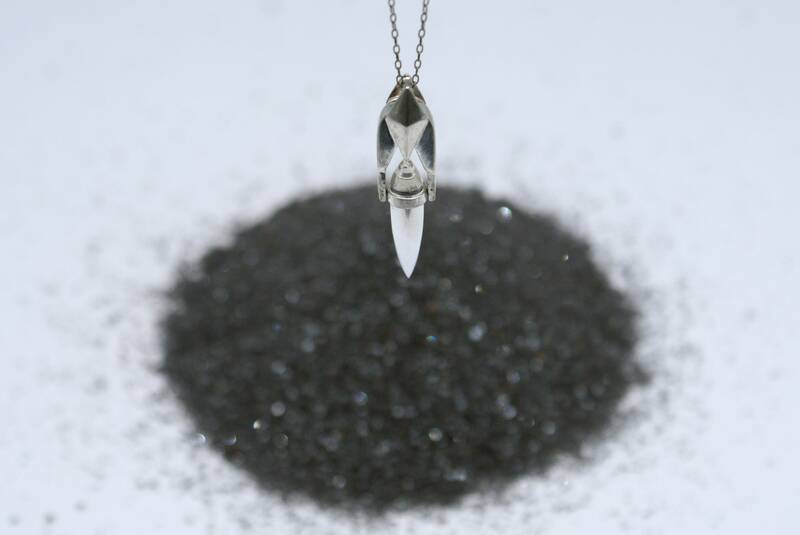 This necklace features a very uniquely cut quartz crystal spike piece that swings freely to and fro on a pin within a solid sterling silver frame. 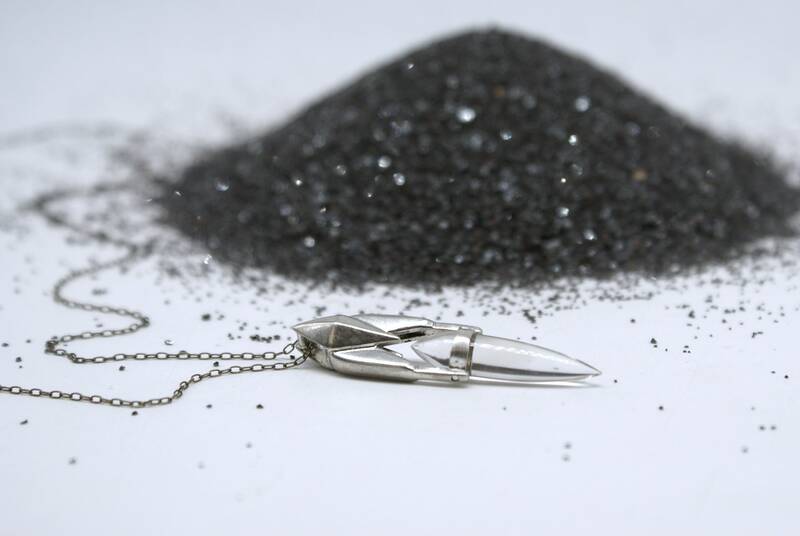 It hangs on a delicate 18" oxidized (blackened) silver chain and is finished with a lobster claw clasp. Paypal and major credit cards are accepted. Your piece will be shipped off to you within 3 weeks of cleared payment. All jewelry is mailed ready for gifting in a beautiful custom box. Most pieces are made to order and ship within 3 weeks of cleared payment. Some pieces, especially from the "One of a Kind" section, ship within 3 days (because they are already made)! ►►► SHIPPING WITHIN THE U.S.A.
All U.S. bound orders are mailed with USPS First Class with USPS Tracking. Delivery takes approximately 3-5 business days. Tracking codes are sent automatically with a shipping notification to the email you supplied at checkout. Tracking is only offered for shipments within the United States. Once I mail your parcel, it is out of my hands. I do not resume responsibility for a package missing in transit. That said, USPS does a fantastic job and problems very rarely occur! Additional postage insurance is available upon request at your expense (a few extra dollars)-- just contact me before checkout if you would like insurance so I can set it up for your order. If your piece is taking longer than usual to arrive, please contact me and we can find a solution. -Shipping times vary! Usually international packages take about 14-20 business days to deliver around the world, but can *sometimes take longer,* depending on customs in your home country. -Please understand that once your order is shipped, it is completely out of my hands. I do not assume responsibility for an order missing in transit. If your piece is taking longer than usual to arrive, please contact me and we can find a solution together. -USPS tracking codes do not apply to worldwide shipping! -Additional postage insurance is available upon request at your expense. Please note that it can be more expensive internationally! Contact me before checkout if you would like insurance and I can set it up for your order. !!! ► PLEASE NOTE: Some countries charge additional customs fees on incoming packages at random. If you are selected to pay a customs fee, I apologize for the frustrating extra expense. Unfortunately it is out of my control and I am not responsible for any part of this extra charge. If you are unsatisfied with your purchase in any way, please let me know. It is extremely important to me that you are pleased with your new jewelry! All refunds and exchanges are dealt with on a case-by-case basis within 7 days of delivery. Please contact me and we will take it from there. Thank you for understanding that all custom and sale purchases are final. Each piece is unique in itself in some way-- hand crafted work is special like that. Slight variations may occur from piece to piece.